In the nation’s poorest counties, the cancer mortality rate is 20 percent higher than in the most affluent counties, and “the difference is much larger for cancers that are the most preventable: cervical, colorectal and lung,” said Rebecca Siegel, strategic director of Surveillance Information Services at the American Cancer Society and an author of the study. Rosa Quinones of Hartford had to give up her jobs after she was diagnosed with breast cancer in 2017. Robert Ciemniewski, 57, a longtime smoker from Connecticut, was on the wrong side of the statistical divide when he walked into the emergency room in 2017 with breathing difficulties from what he thought was pneumonia. He did have pneumonia, but he also had advanced lung cancer. Ciemniewski had not had a health checkup since 2013, when he quit his job as a mailman to care for his ailing mother. After he started working again delivering car parts for $12 an hour—a sharp drop from the $37 an hour he made at his postal job— he couldn’t afford health insurance. “The premium was more than $200 a month and deductibles were over $7,000,” he said. Now, unemployed again, he lives at his brother’s house in Wallingford because he could no longer afford the rent on his Hamden apartment. Rosa Quinones, 47, of Hartford had to give up her jobs at a school cafeteria and an office after she was diagnosed with breast cancer in 2017. “I could no longer push the cleaning cart and lift the vacuum and big mops at my night job,” she said in Spanish, translated by her patient navigator Ivonne Lopez, who works at the Hispanic Health Council in Hartford. Data show that income levels influence survival rates. “Mortality is higher with diminished resources,” said Dr. Anees Chagpar, assistant director of global oncology at the Yale Comprehensive Cancer Center. The biggest barrier is the cost of care, which is projected to reach $173 billion nationally in 2020, up by 39 percent from 2010. The Hispanic Health Council’s collaboration with Hartford Hospital is among several partnerships statewide to make mammograms free and easy to access in low-income neighborhoods. Women who lack transportation, or those who are unable to take time off for health checkups during work hours, are scanned at mobile vans fitted with mammogram units. “Losing a day’s wage is not something these women can afford,” Lopez said. Even though insurers in Connecticut can no longer refuse to cover mammograms, nonprofits say some women are still struggling with their share of out-of-pocket costs. “It’s a covered benefit, but women might be responsible for a co-pay or a deductible,” said Damaris Velez, program coordinator at Project Access-New Haven. The free mobile vans, they say, are essential for early diagnosis. A 2018 report from the Kaiser Family Foundation shows that Ohio and Kansas had the highest mammogram rates in the U.S. at 81 percent, while Connecticut had the lowest at 61 percent. 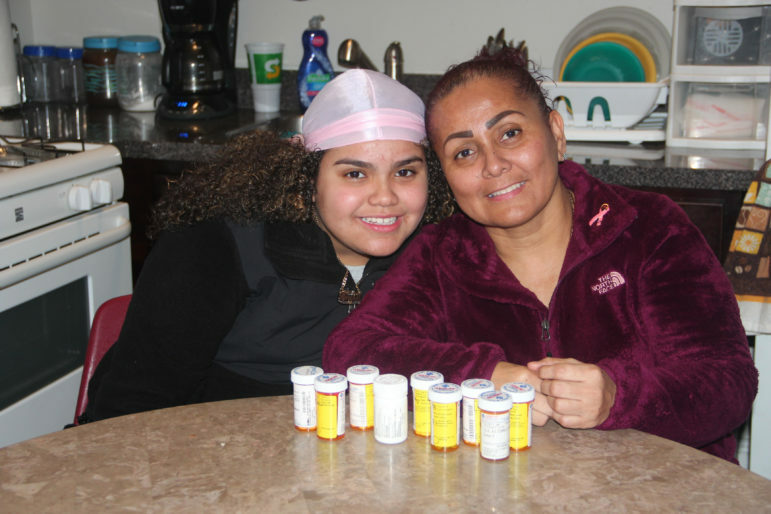 Rosa Quinones worries about being able to support her daughter, Kenia. Nonprofits such as the Wilton-based Circle of Care pay not only the cost of cancer treatment, but for gas and groceries as well. The organization helps families with children who have cancer when parents have had to reduce their work hours or quit their jobs entirely to care for their child. “With 70 percent of families experiencing a financial crisis during treatment and 50 percent of the families we serve living below the poverty level, we ensure that no parent has to choose between caring for their child and providing for their family,” said Gina Marie Longo, executive director of Circle of Care. The silver lining is that “social safety nets in Connecticut are more inclusive,” said Fred Carstensen, professor of economics at the University of Connecticut. By expanding policies such as the Earned Income Tax Credit (EITC) and paid sick leave, he said, the state would ensure that its most vulnerable residents don’t fall through the gaps. Under the Connecticut EITC program, working individuals earning a low to moderate income are eligible for a refundable state income tax credit. These lifelines can determine the odds of survival and the quality of a cancer patient’s life. Ciemniewski receives free treatment at Smilow Cancer Hospital at Yale. Quinones is exempt from paying rent under a government housing initiative for low-income families. The American Cancer Society study did report several encouraging developments including, racial disparities are slowly narrowing. In the U.S., the cancer death rate was 47 percent higher for blacks than for whites in 1990. That difference shrank to 19 percent in 2016. The drop is attributed to smoking cessation campaigns initiated among black teens in the 1970s. “So, the narrowing in the racial disparity that we are seeing now is the benefit of those smoking declines,” Siegel said.